Big, Strong and Gorgeous. No not George Clooney. 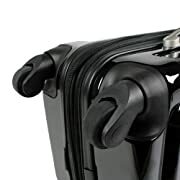 But from buyers comments the Vojagor® TRSE05 4 Piece Suitcase Set are quality suitcases and seem difficult to fault. And at around £100 for 4 suitcases! Now that’s got to be a real bargain. Vojagor luggage is made by JAGO Ag Stuttgart , Germany. In less than ten years, JAGO AG has grown from a one-man-company with a turnover of €200,000 to an international firm with hundreds of employees and a turnover of €93,000,000. They roll extremely smoothly and as if they weren’t big enough they’re expandable too. The internal pockets and straps also make for awesome organisation. Very solid and easy to pick out in the baggage claim. Very spacious and just in case there isn’t enough room inside, they’re also expandable!